When I returned from Antarctica, I embarked on a brilliant road trip, mostly around the northeastern USA. It was time based on watching En Sabah Nur play in the college series and fitting in as many friend visits as I could. A big thank you goes out to each of those friends who took time to visit me during their busy days or hosted me for a night or two. Big kudos to Dave W. for putting me up for a full week! That made my stay in Denver a lot better. My trip started out with an entirely too short of a visit with my mom who took care of my dog, Sabah, so well while I was gone. My reunion with Sabah was brilliant. She gave me the eye for a couple seconds before poucning all over me and then following me around. I think we spent the first 10 days straight together. Yes, I do spoil her, but I missed her a ton. I was hoping for a week long visit with my mom, but that got cut short when Metro East Regionals in Princeton, NJ were moved up a week. Sabah and I got to sleep a night and then bee line it to Pittsburgh for five hours sleep and Maple Blondie ice cream compliments of Stu and Acadia before heading over to Regionals. For some reason, I can't get the map to load of my road trip. Click here if you need a visual. My sister, Jen, and I on a hike. Regionals was amazing and tough. I loved meeting the new guys on the team. It was great to see them roll through their pool and play well. Unfortunately, we, En Sabah Nur (University of Pittsburgh men's ultimate), always seems to get jitters in semifinals or finals and drop a game we could or should win. En Sabah Nur lost during finals to Cornell. They were playing great D, but Cornell just kept putting up these stall 9 hucks that they also came down with. They were game changing big plays. En Sabah Nur claimed the second bid to nationals by winning the Pittsburgh Cup for the sixth year in a row. I believe they are only one of four teams to have qualified for nationals that many years in a row. Someone with some more free time, please correct me. After regionals in Princeton, NJ, I was off to Chestnut Hill in Philadelphia to visit Phil, Sam, and my brother. We ate good food, ran Sabah on the Forbibben Drive, and enjoyed some down time after moving too quickly for too long. Then, I hit the headed for New York City, my favorite big city in the world for a visit with the one and only B-E-double tizzie, as B-Nelson calls her. I was also able to sneak in a quick reconnect with a friend from my Baltimore days. YES, I do keep in touch with a couple. New York was good, but too rushed. Sabah definitely wasn't resocialized to new people and dogs after being with just my mom and her pups for so long. After NYC, I bolted off to Northampton, MA to see my sister. It was really good to hang out in the woods after so many days in cities. It also was down right cold there, which I loved. Everywhere else had been a bit hot for my liking. We ate well, hiked, rested, and took a timeout before a brilliant moment of serendipity. I had a date with my high school friends in Danville, PA, but before I left Northampton, a Stadlin twin contacted me about visiting and it happened to be on my way. I stopped in, surprised his twin, and met an ex-Ice person. It was kind of random, but definitely a treat to share a common bond with someone even though we had never deployed together. The twins are running an organic farm summer camp, Eden Village Camp. When I was their resident assistant in college, they would have made the perfect camp counselors. I would never have put them in charge of the entire camp. They have matured. They have evolved and are doing a fantastic job with the camp. Their kids get there in two day and I can't wait to see how well they do. It is amazing, so amazing. The Stadlin twins, original En Sabah Nur members. After getting distracted at Eden Village Camp, I scooted down to Danville, PA to have dinner at the Old Forge Brewery. Who knew that my hometown of 15,000 was hip enough to have its own brewery? I didn't because I haven't really been back through there in over 5 years. I wasn't there nearly long enough, but it was great to be there and I hope to get back soon. From there, I bolted to State College, PA to see Kat and Matt. They were about to burst with their first born. From there, I was off to see Jay and Karen in Baltimore. Somehow, he is still in the same apartment that we shared. He still doesn't like it, but he loves how close it is to his job. I look forward to visiting him when he finally gets to commute from home. I suspect he'll live in the woods with a horse shoe pit that can be thrown into from his living room couch. I also got to see my old coworker Yee when I was there. She might be coming to Europe while I am here, but she has trouble finding directions for her daily commute so I'm not sure she'll actually make it. Next up was a run down to DC to visit a Tim Tam lover and then I reconnected with a Semester at Sea friend. It was pretty neat to reconnect with her after six years. If she is reading this, she is going to be making herself miserable as I have adventures and she heads back to school. Sabah checks out the Washington Monument. Bamma and BNelson in Ohio. When I left DC, I cut through western Maryland and stopped at my favorite spa near Uniontown. It is always a treat to stop there. It set the tempo for a great week in Pittsburgh. So many old friends. So many good memories. I might move back there some day. I think the biggest part of my week was trying to get the bathroom at Swinburne in order. The fan had died. Mold had gone wild. We had to strip everything and with Dave and Ben's help, we did it. It wasn't pretty. I'll know better for next time about what goes into wall paper stripping, spackling, surface prepping, and priming. It still needs a coat of paint. It is messy. It is a pain, but I'm glad I learned. My favorite part of my Pittsburgh visit was being introduced to Oh Yeah ice cream or getting the chance to coach and play against the current En Sabah Nur team with a bunch of alumni and other Pittsburgh all stars. For one short day while in Pittsburgh, B-Nelson and I booked it out to Ohio to see Bamma. Bamma rocks. Simple as that. Sabah wants inside in Detroit. Flowers at my dad's new place. What are they? After Pittsburgh, I headed up just north of Detroit to see my dad's new place and hospital. It seems like a temporary fit for him since it is so far from the sea he loves to sail in. My visit back to my mom's afterwards was a bit longer, but interspersed with trips down to Madison to see En Sabah Nur play at college nationals. They made it to semifinals. Best finish yet and I think they are hungry for more. The week was a bit rushed, but it was great to have all my brothers and sister in one place for a change. We couldn't remember the last time the four of us had hung out. It was long overdue and we might just need to do it again in the future, if I ever stay put long enough. The Brotman kids by firelight along the Wisconsin River. Sabah goes merry go round at Lake Wazeecha. 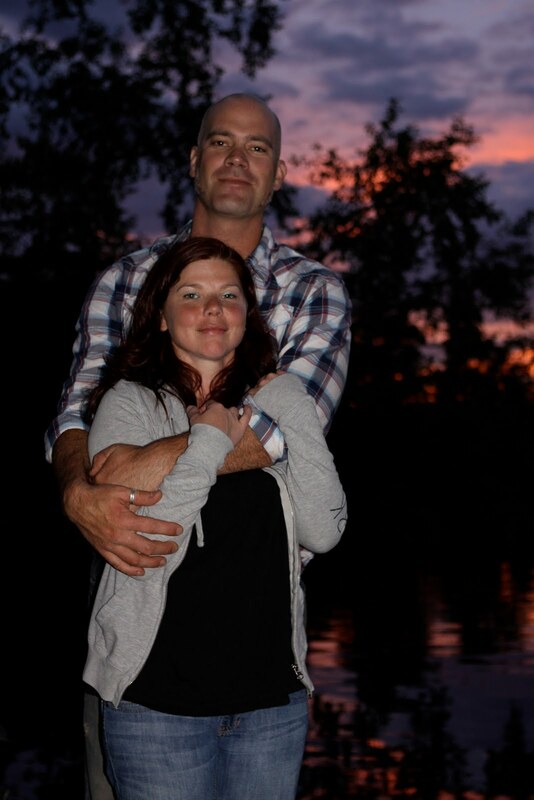 Jen and Greg at sunset on the river. Sabah prepares to attack the dragonflies. A bald eagle on the St. Croix River. On my way to Colorado, I stopped along the St. Croix river to visit an Ice friend who took me and Sabah canoeing to a bald eagle's nest. Very cool. From there, I visited a very old friend, Chedd's, the gourmet grilled cheese shop. The one in Denver closed, but while I was gone a new one opened up in Sioux Falls, SD. Yum! 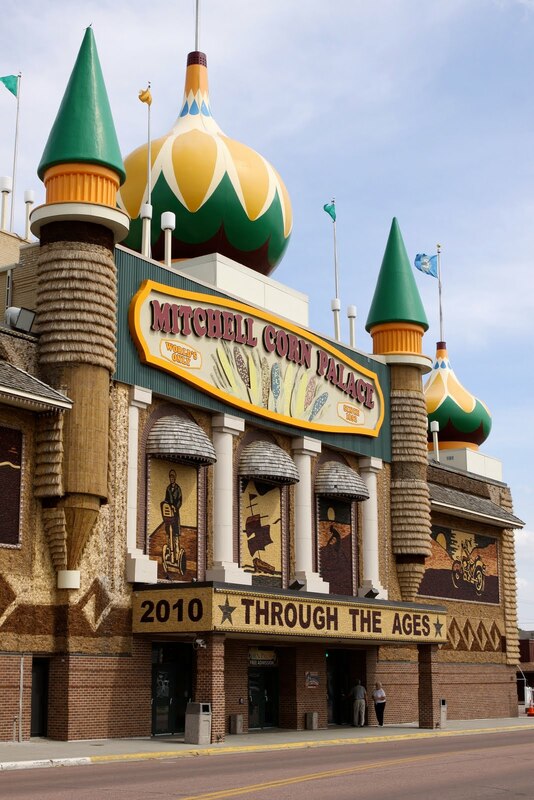 Now, I know to stop in South Dakota for Mt. Rushmore, the Black Hills, the Badlands, AND grilled cheese. However, the white prairie dogs I ran across in the Black Hills were pretty cool too and might warrant a sunny day visit. Sabah definitely wants a chance for an up close and personal visit. 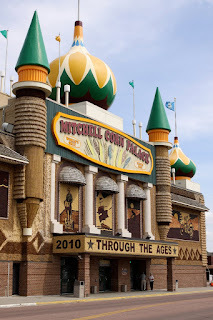 The Corn Palace in South Dakota. White prairie dogs near Badlands National Park. My next stop was in Sheridan, WY to see the Rhoda and Lenny, two of the warmest people on the Ice. I look to them as a model about how to balance stability and the traveling life style. Sheridan is just big enough to give a little variety, but small enough to foster community. I really liked it and while I was there I realized that the future of my traveling depends on finding a situation similar to what Rhoda and Lenny have. I need a home base, but more on that soon. Sabah tries to play with a bison in Sheridan, WY. The mountains near Sheridan, WY. After Wyoming, it was back home to Colorado. I visited friends, mountain biked, hiked, played ultimate, ate good food, got ready for my bike tour, and generally ran myself ragged. Except for one small hiccup, my trip home was great. I realized more what I want from the community there. It might have helped that I was in such a different place than when I was last in Colorado. I broke my visit up with quick visits down to Colorado Springs, up to Fort Collins, and over to Summit County. Man, I miss it. I'm not sure if Denver will be home anymore unless I can commute by bike because of the traffic, but Colorado is still in the running. Love those mountains. Sabah at a very high water Boulder Creek. One of Sabah's favorite games, bite the water out of a sprinkler in Colorado Springs, CO.
finally see a family picture! :-) sweet.